Unbeaten after two games for the sixth consecutive year, Denver showed its tenacity in a pair of fourth-quarter comebacks at home. Now it’s time to see if the Broncos can win on the road. Quarterback Case Keenum, record-setting rookie running back Phillip Lindsay, standout receiver Emmanuel Sanders and the NFL’s second-ranked offense will be tested Sunday by the Baltimore Ravens, who are 60-21 on their own turf since coach John Harbaugh arrived in 2008. Keenum orchestrated a late drive for the game-winning field goal last week against Oakland after throwing for 329 yards and three touchdowns in his Denver debut versus Seattle. Lindsay is the first undrafted rookie in NFL history to top 100 yards from scrimmage in each of his first two games, and Sanders has 14 catches for 231 yards and a score. All that aside, the Ravens (1-1) know the outcome could depend on how well they handle Denver linebacker Von Miller, who’s already got four sacks as the focal point of an aggressive defense. The 6-foot-3, 250-pound Miller is vastly quicker than he looks. Ravens quarterback Joe Flacco struggled in the first half of a 34-23 loss to Cincinnati last week, but he finished with 376 yards passing and has a 15-5 touchdown-to-interception differential in his past nine games. His success on Sunday could very well depend on how Baltimore handles Miller, who has three sacks in two career regular-season games against the Ravens — both of them victories. In a 2013 playoff game, Miller had a half-sack and seven tackles in a 38-35 double-overtime defeat. Lindsay had his first 100-yard game rushing last week to go with a 71-yard effort on the ground against Seattle. The 5-8 rookie out of Colorado and 2018 third-round draft pick Royce Freeman (99 yards rushing) have developed into an effective 1-2 punch. Baltimore looked at Lindsay before the draft, and now they’ve got to stop him. 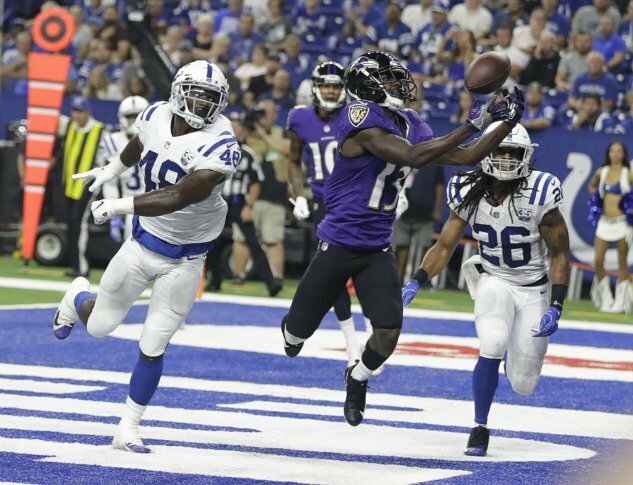 Free agent receiver John Brown has scored a touchdown in each of his first two games with Baltimore. Brown rang up 1,003 yards and seven TDs with Arizona in 2015 before being slowed by injuries the following two years. Keenum starred with Minnesota last year, and his sizzling start with Denver lifted his record as a starter to 13-3. Keenum missed practice Wednesday with a sore knee, the result of a few hits he took while scrambling out of the pocket against Oakland. Keenum has played against Baltimore three times with three different teams. Former Ravens linebacker Ray Lewis, a 2018 Hall of Fame inductee, will be honored by the team over the weekend. There will be a parade in Baltimore on Saturday. On Sunday, Lewis will make an on-field appearance just before the kickoff and will be presented his Hall of Fame ring at halftime.